Entertaining Food: Ooooh, So Wild! The Triple Door (http://www.thetripledoor.com) is my absolute favorite live music venue. As Wild Ginger shares the kitchen and menu, it's no surprise that the food is incredible regardless of the show you decide to see. And, because I wanted to impress my chef sister, it was exactly where we had to dine during her recent visit to Seattle. 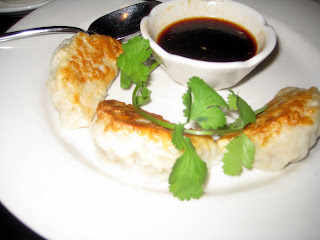 Debi has a thing for Potstickers and Wild Ginger's are amazing: large, plump, golden crispy on one side, and the serving of six are definitely not enough for two if you love potstickers. The soy-black vinegar dipping sauce is a perfect compliment to the traditional chicken filling. The Chicken Satay took some explaining from Ryan, our extremely cute waiter. The chicken meat is minced, combined with with coconut milk, lemongrass, and other spices, then reformed into a skewered tube of meat. I know, I know, and I wish I had a better description, but trust me, it's fantastic. All my sister could get out was, "Yumm, yumm, yumm!" 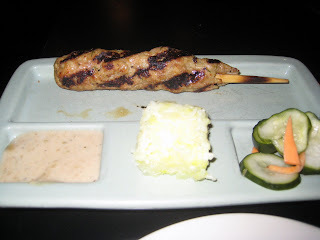 The satay is served with a delicious peanut sauce, a small cube of sticky rice, and an incredible, "I could eat an entire plate of this stuff" cucumber salad. For our entrees, we both selected the Seven Flavor Beef. 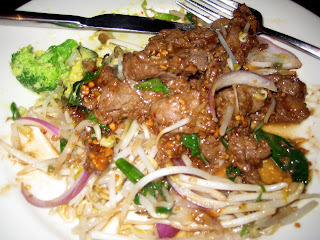 Ginger, chilies, garlic, hoisin, lemongrass, peanuts, and basil frolick around tender, juicy, thinly sliced flank steak. I actually don't eat steak unless it's this dish and I've been ordering it every single time I see a show at The Triple Door or eat upstairs at Wild Ginger. Yes, it's that good! 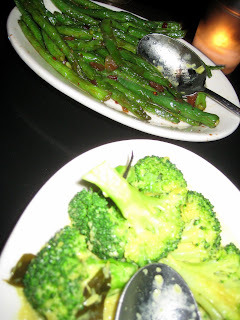 And speaking of "that good", the Szechuan Green Beans and Curried Broccoli are the perfect sides. Our green beans were a tad bit less cooked than we'd want, but the curried broccoli should really be its own vegetarian entree. The garlic is sweet and the broccoli is cooked well (still plenty of meaty texture remaining). If you're looking for consistently excellent Pan-Asian food, look no farther than just across the street from our symphony hall. Wild Ginger is sure to impress. I am not a fan of duck, but I have actually had the buns before and they were delicious (they actually had flavor instead of the usual blah served so many other places).